Durban is an overflowing treasure chest of things to discover and do – and the best part is, you don’t have to be a tourist to explore it. You’re a local – everything Durbs has to offer you is right on your doorstep! To make the most of it, all you need is some free time and some of that epic weather Durban is renowned for. And this is where Durbs Thursdays comes in. This is your weekly guide to discovering Durban. And we’re not talking rickshaws or bunny chows. Been there, chowed that. We’re unveiling our city’s secrets, and giving you the chance to see Durbs like you’ve never seen it before. 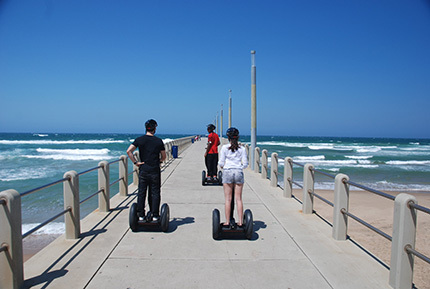 Our first Durbs Thursday discovery: the Segway Gliding Tour. You’ve walked along the beachfront, maybe you’ve skated or even taken in the sea air on a bicycle. Now what we want to know is: have you ever explored it on a Segway? Picture it: you gliding along the promenade, the wind in your helmet, taking in the view and the tour operators tidbits of info – and you don’t even work up a sweat. What’s not to like? There aren’t many reasons you wouldn’t want to do some exploring on a Segway. Just want to see uShaka Beach? Or maybe you’re keen for the Moses Mabhida All Access Tour… there’s a wide range of Segway Gliding Tours to suit every glider and every wallet. So get your buddies onboard and make a morning of it.